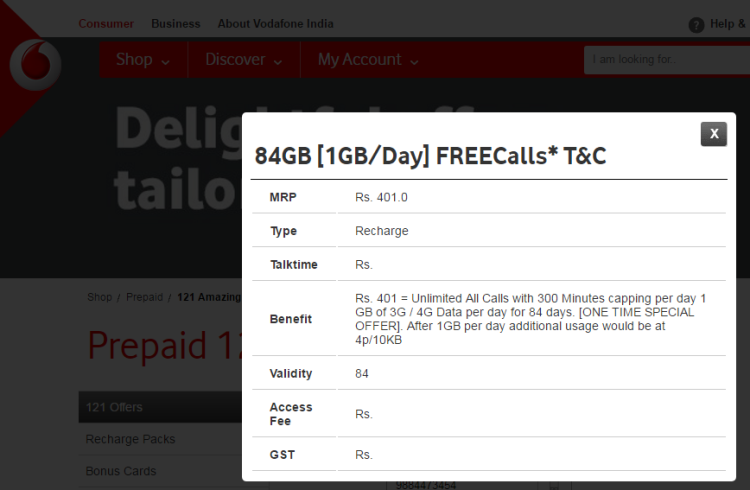 After Idea & Airtel, Vodafone India has started offering its existing customers Unlimited Local & STD calls with Unlimited Data (1GB data per day) for 84 days. Just like Airtel 399 Plan, Idea 399 Plan & Jio 399 Plan, Vodafone too has started rolling the Unlimited Plan (Vodafone 399 Plan) for its customers. Since it is Users Specific Special Recharge Offers, every Vodafone existing customer would get different price for Vodafone 399 Plan and the same can be checked via MyVodafone App or Vodafone 121 Prepaid Offers portal at this link. Under this Vodafone 399 Plan for existing customers, Outgoing Calls in Roaming would be charged at Standard Roaming Tariff and only Incoming Calls would be Free. Also you can use Data Balance (1 GB per day) in Roaming for Free. Vodafone 399 Plan – How to activate? MyVodafone App – You can install MyVodafone App on this link and install it. After installation, you can recharge your Vodafone number with your special offers. Vodafone Website – You can visit this link to know the exact denomination of recharge for your number and recharge. Offline Retailer – Once you have confirmed the amount required for recharge by dialing *121#, you can proceed to ay offline retail shop for the recharge. Vodafone 399 Plan – Alternatives? I want unlimited calling and data for 84 days on 3G handset.